Pilgrimages to former WWII concentration camps for those of Japanese descent were started in the late 1960s. It took nearly a quarter century for former prisoners and their descendants to question why they had been imprisoned and begin searching for answers. The first formal pilgrimage to Amache in 1975 was organized by Marge Taniwaki and Russell Endo, along with members of the Community Action Research Program and students from the University of Colorado at Boulder. The pilgrimage was funded by a grant from the state of Colorado, and it was one of the official 1975-1976 events commemorating the centennial of Colorado’s statehood. The Denver Central Optimists Club (now the Amache Club) took over the Pilgrimage organizing in 1983 and erected a second cemetery monument to US military casualties from Amache. The first stone monument was left by prisoners as they departed Amache in late 1945. In conjunction with Granada High School teacher John Hopper and his students, the cemetery site has been transformed with trees and grass watered by a drip-irrigation system, creating an oasis in the arid countryside. The annual Amache Pilgrimage takes place on the Saturday before Memorial Day weekend. Two bus pick-up points are available. The first pick-up will board at 6:00AM at Simpson United Methodist Church, 6001 Wolff Street, Arvada 80003; the second pick-up will be 6:30AM at downtown Denver’s Tri-State Buddhist Temple, 1947 Lawrence Street, Denver 80202. Attendees are encouraged to board at Simpson where parking is more plentiful. The roundtrip fee is $30.00. Snacks are provided and continuous educational programs run on overhead bus screens on the restroom equipped vehicle. There is time to share conversation with other passengers, some of whom were forcibly removed to Amache or to one of the nine other major US concentration camps. After a short rest stop in Limon, the bus will arrive at the Amache cemetery at approximately 11:00AM for a brief memorial service and oshoko (offering of incense) to commemorate those who died while imprisoned there or while serving in the US military. Attendees will then meet at Granada Undivided School, where lunch and a short program will be provided, and the bus will re-board by 2:30 for the return trip to Denver; passengers will be dropped off in reverse order of the morning, and can expect to arrive back at Simpson by 6:30-7:00PM. Bus Information Thanks to generous support from the Japanese American Association of Colorado, the charge for the bus is still just $30 per person. Reservations must be made and paid in advance. For bus reservations view the printable Amache Pilgrimage 2019 Flyer. For attendees who are arriving by private car, there will likely be a catered dinner/discussion on Saturday night (nominal fee/donation) starting at 5:00 p.m. at the Amache Resource Center near the Amache Museum in the town of Granada. Attendees usually include survivors who share memories of camp. Hotels are available in Lamar, Colorado, 17 miles to the west on Highway 50. On Sunday, we are working to make sure that people will be available at the Amache site to help visitors find their family’s barracks and that the Amache Museum will also be open and staffed. Another option is visiting the Sand Creek Massacre National Historic Site, located 35 miles northwest of Amache, where visitors can learn about the woman for whom the Amache Relocation Center was named and her Cheyenne sub-Chief father, Ochinee, who was killed at Sand Creek in 1864. For those flying in and renting a car, Colorado Springs is an optional airport that can save close to 100 miles driving distance vs. arriving in Denver. 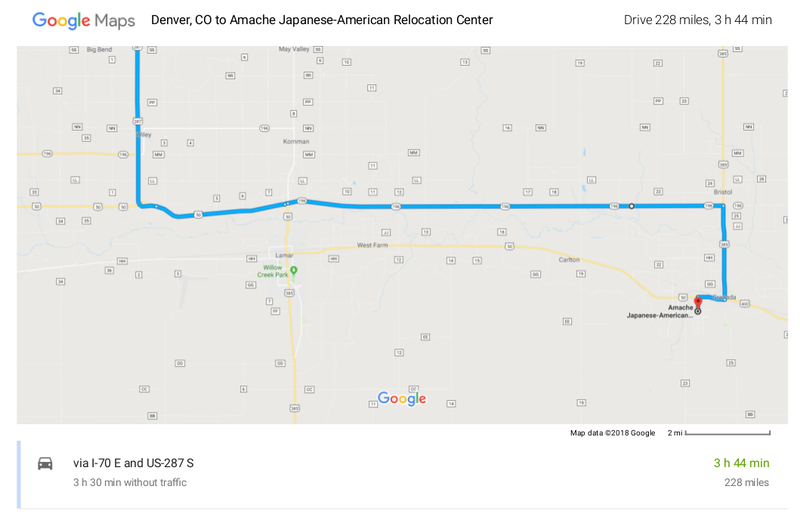 Pilgrims can drive from Colorado Springs south on Interstate 70 to Pueblo, Colorado, then due east on Highway 50 to Amache, planning to arrive at the cemetery by 11:00 a.m. on Saturday. This year, the Lamar Days Parade will begin at 10:00 am on May 18, 2019 and will be along the route to Granada from Lamar. To avoid the parade, you can take a back road to Granada that used to be Highway 196 but is now a county road. You will need to turn at the Big Timbers Museum on the big curve that heads to Lamar. That road will take you to a point between Bristol and Granada, Colorado. You will take that road for 17 miles, and then at the stop sign you will turn right to go into Granada. Once in downtown Granada you need to turn right and head back West to the Amache turn off. This road used to be marked but now that it is a county road, it is not marked as well. If you end up in Lamar, you will be waiting for some time. The parade route will start on Highway 50 and move slowly West towards Lamar. The proximity of Amache to the town of Granada created a situation unique among the WRA camps. Inmates were close enough to Granada that walking into town to shop or even just visit a soda fountain was a common occurrence. The positive effect this had on camp morale was noted by the WRA.